You spend a good proportion of the evening washing, moisturising, toning and maybe even exfoliating your face, ensuring it is thoroughly clean and treated for a night of beauty sleep. For most, we do this to ensure that the face is free from make up, general grime and sebum. As you may know if traces are left behind, they can clog the pores and result in blemishes - something the vast majority of us actively try to avoid. However it is equally as important that you cleanse your face in the morning too. Why? Well first of all when we sleep, we sweat and produce excess oil - some more so than others but we all do it, especially in the currently humid weather. Is said sebum harmful to the skin? No, it is entirely natural but in some cases if not rinsed away it can not only result in clogged pores but pesky blemishes too. If like myself you use various lotions and potions before tucking yourself into bed, it is equally important that come the AM, you cleanse your face to ensure all traces of product are removed, however invisible they may seem to the naked eye. Oddly such product residue from evening use can alter the finish or effectiveness of any product, make up or skin care centric applied on top. This is something I never as much as considered before; sure I cleanse my face each morning, more so out of habit than anything else. A routine installed within me as a child but if anything it is more important now, as a product hoarding/wearing/slinging (delete as appropriate) adult than it was back then. Thanks Mum! Forget double cleansing in the morning, your skin doesn't require it - simply find a gentle cleanser that best suits your skin's needs. 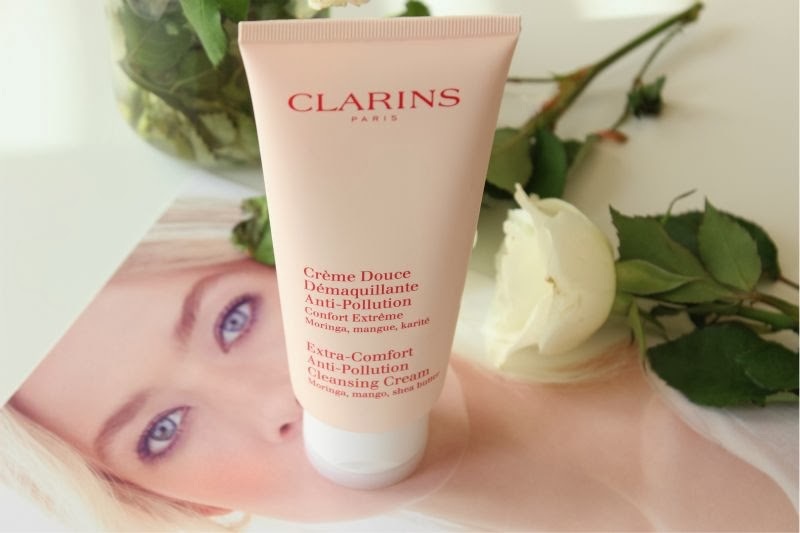 I tend to skip anything oil based (too much effort when bleary eyed) and go for cream cleansers in the AM, my personal favourite is Clarins Extra-Comfort Anti-Pollution Cleansing Cream but I have been know to use and enjoy The Body Shop Vitamin E Cream Cleanser. Both are great to quickly refresh and cleanse the skin and are not drying in the slightest and a perfectly suit to most, if not all skin types. Have to say, I'm kind of disappointed that the answer to the question "Should you cleanse your face in the morning?" is a big old YES. I'm so bad for just rinsing it in the shower then applying moisturiser, which is so lazy. I'm kind of grossed out that I've been adding moisturiser and makeup over sebum etc! I would say that rinsing your face is better than nothing at all! There's probably people who don't even do that so I wouldn't worry! I always cleanse my face in the morning. I love using the Una Brennan Rose Creamy Cleanser as it's really light and not too intense for the morning. My skin always looks more fresh afterwards too. I always used to cleanse in the morning but not the evening, now I do both! I love how my skin feels so I can see the benefit! I just use a micellar cleansing water from Garnier as I've noticed that a cleanser can actually irritate my skin. This way is enough to get rid of the product buildup from my nighttime routine and freshly apply some moisturiser. Cleansing the skin in the morning is so important! A gentle cleanser - like you said - will do and I find it makes such a difference. Tbh, I only wear eye make up nowadays so I don't cleanse in the morning or at night - naughty I know, but my skin hates it! I am quite shocked how many people don't cleanse in the morning!! To me it's like not taking a shower! Me too, it grosses me out! I often do a face mask in the shower in the morning, I find it a great way to start the day and my skin loves me for it. If I'm not doing a mask I'll use a creamy cleanser. I love my Clarins Gentle Foaming Cleanser with Shea Butter - I cannot not cleanse my skin in the morning! I always cleanse in the morning, I would feel way too gross and grimy if I didn't! I too prefer a cream cleanser for morning, they leave me feeling fresh and ready for the day! I always cleanse in the morning, it really helps freshen your skin up and clear the grime - I use a gentle AHA cleanser which does wonders! I stick with my Body Shop Tea Tree Facial Wash in the morning as it really wakes me up- out of habit more than anything thanks to my mum too! I can't imagine not doing it now though, I feel like a zombie otherwise. I keep my morning skincare routine down to a minimum, then spend more time double cleansing etc. at night time, I find it so much more effective! Hello :) technically no as face wipes won't remove all traces of sweat and product that has not been absorbed by the skin but I know not everyone will agree, I do think it is better than nothing. I hope this helps.